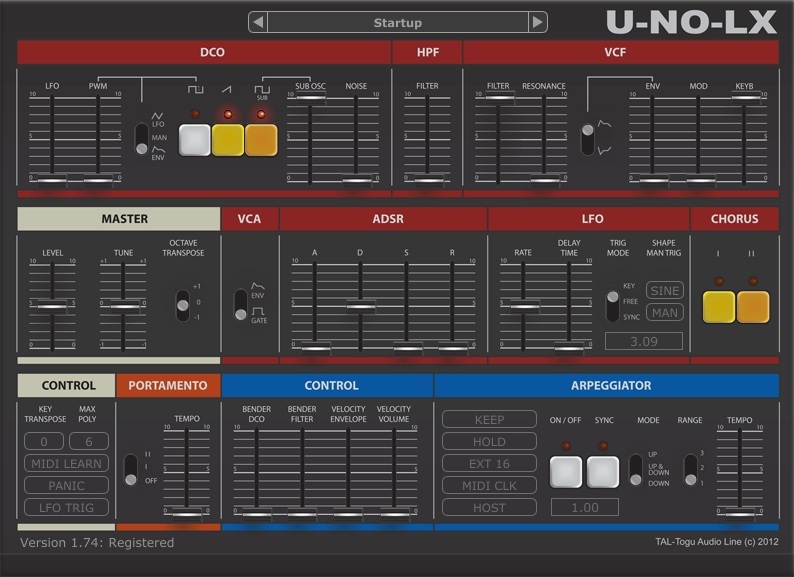 TAL-U-NO-LX is a virtual synthesizer based on a popular synth hardware. TALcombined the benefits of digital plugins with analog audio qualities - featuring zero feedback delay filters and carefully calibrated controls. To get your preferred synth sound, this plugin comes with a fast envelope that feature smooth roll-off, emulated inaccuracy and smooth filter sound. TAL-U-NO-LX supports different filter LFO waveforms and portamento. It comes with an arpeggiator with different sync modes and hold function. Calibrated and matched to TAL's hardware synth. Better alias free oscillators for an authentic sound also @ 44'100Hz sampling rate. Better and new calibrated chorus. Now reads presets that are saved in the plugin sub folder: "/TAL-U-NO-LX/presets/". Bugfix fo issue where plug-in does not show up. Bugfix for OS X 10.5.8 and PPC compatibility issue. Bugfix for Slider / mouse-wheel problem. Bugfix for Losing registration issue on some OS X systems. Updated Interface with enhanced buttons and centered sliders. Enhanced voice handling and note steeling. Changing arpeggiator mode while in hold mode fixed. Losing MIDI LEARN assignments fixed. Velocity sensitive EXT 16 sync. ARP hold while changing program fixed. MIDI Learn assigns more than one MIDI controller to a GUI control fixed. Host notifies automation parameters and preset name while changing presets. It's possible to change preset location from the context menu.n. Fixed arpeggiator hold and sustain pedal behavior. Sustain pedal enables or disables arpeggiator hold. Sustain pedal in normal mode fixed. Enhanced factory presets by FMR. Presets not showing up in the context menu after a while" issue fixed. Crash in Cubase SX 2 / 3 hosts fixed.